Thierry Meyssan: After Yugoslavia, Ukraine? 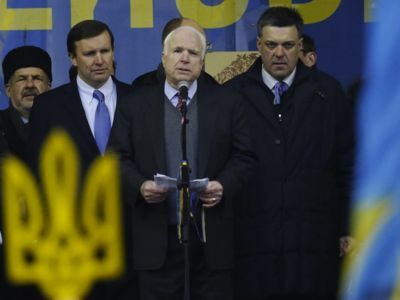 Senator John McCain, who monitored the «Orange Revolution» of 2004 and supports jihadism in Syria, addresses protesters on Maidan Square, 15 December 2013 . Nazi leader Oleh Tyahnybok can be seen on his right. After having dismembered Yugoslavia during a ten-year civil war (1990-1999), has the United States decided to destroy Ukraine in a similar way? This is what could be inferred from the maneuvers that the opposition is poised to launch during the Sochi Olympic Games. Ukraine has been historically divided between, in the West, a population turned towards the European Union and, in the East, a population oriented towards Russia, plus a small Muslim minority in Crimea. After the country‘s independence, the government gradually crumbled. Taking advantage of the confusion, the United States organized the «Orange Revolution» (2004) , which brought to power a mafia clan, equally pro-Atlanticist. Moscow responded by lifting its subsidies on gas prices, but the Orange government could not rely on its Western allies to help pay the market price. Ultimately, it lost the 2010 presidential election in favor of Viktor Yanukovych, a corrupt politician, and an on again/off again pro-Russian. On 21 November 2013, the government renounces signing the Association Agreement negotiated with the European Union. The opposition responds with protests in Kiev and in the western part of the country, which quickly take on an insurrectionary appearance. It calls for early presidential and parliamentary elections and refuses to form a government when approached by President Yanukovych and the Prime Minister resigns. The events are baptized Euromaidan, then Eurorevolution, by Radio Free Europe (run by the State Department). The crowd control for the opposition is provided by Azatlyk, a group of young Crimean Tatars who returned from Jihad in Syria especially for the occasion . The Atlanticist media champion the cause of the «democratic opposition» and condemn Russian influence. High-profile Western figures turn up to manifest their support to the protesters, including Victoria Nuland (Assistant Secretary of State and former Ambassador to NATO) and John McCain (Chairman of the Republican branch of the NED). For its part, the Russian press condemns protesters who have taken to the streets to overthrow democratically elected institutions. Torch-lit march of 15,000 Nazis in Kiev on 1 January 2014. At first, the movement seemed to be an attempt to orchestrate a second «Orange Revolution.» But on 1 January 2014 the power in the street changes hands. The Nazi «Freedom» party organizes a 15 000-strong torch-lit march in memory of Stepan Bandera (1909-1959), the nationalist leader who allied himself with the Nazis against the Soviets. Since this event, the capital has been covered with anti-Semitic graffiti and people are attacked on the street for being Jewish. The All-Ukrainian Union “Fatherland” (Batkivshchyna), led by the oligarch and former Prime Minister Yulia Tymoshenko (serving a prison sentence following her convictions for embezzlement) and currently headed by lawyer and former Parliament speaker Arseniy Yatsenyuk. It stands for private property and the Western liberal model. It garnered 25.57% of the vote in the 2012 parliamentary elections. The Ukrainian Democratic Alliance for Reform (Udar), of former boxing world champion Vitali Klitschko. It claims to identify with Christian Democracy and picked up 13.98% in the 2012 elections. The All-Ukrainian Union “Svoboda” (Freedom), led by the surgeon Oleh Tyahnybok. This political group sprang from the National Socialist Party of Ukraine. It promotes the denaturalization of Jewish Ukrainians. It won 10.45% of the vote in the 2012 parliamentary elections. The Congress of Ukrainian Nationalists, a Nazi splinter group from the former NATO stay-behind networks in the Eastern Bloc . A Zionist, he calls for the denaturalization and deportation of Ukrainian Jews to Israel. He received 1.11% of the vote in 2012. The Ukrainian Self-Defense, a nationalist splinter group that sent its members to fight the Russians in Chechnya and Ossetia during the Georgian conflict. It got 0.08% of the vote in 2012. In addition, the opposition has received the endorsement of the Ukrainian Orthodox Church, in revolt against the Moscow Patriarchate. Ever since the Nazi Party took over the streets, the demonstrators – many of them wearing helmets and dressed in paramilitary uniforms – have erected barricades and stormed government buildings. Certain elements of the police force have also displayed great brutality, going so far as to torture detainees. A dozen protesters were killed and nearly 2,000 were wounded. The unrest spread to the western provinces of the country. According to our information, the Ukrainian opposition seeks to import military materials acquired on parallel markets. It is obviously not possible to purchase weapons in Western Europe and bring them in without NATO’s green light. Washington’s strategy in Ukraine would appear to be a combination of proven “color revolution” recipes with others recently concocted during the “Arab Spring” . Moreover, the United States makes no effort to hide it, having dispatched two officials, Victoria Nuland (deputy to John Kerry) and John McCain (who is not only a Republican senator, but also the chairman of IRI, the Republican branch of the NED ) to support the protesters. Unlike Libya and Syria, Washington does not have jihadists on hand to sow chaos (except for Tatar extremists, but they are only located in Crimea). It was therefore decided to lean on the Nazis with whom the State Department worked against the Soviets and has organized in political parties since Ukraine’s independence. The inexperienced reader may be taken aback by this alliance between the Obama administration and the Nazis. However, it must be remembered that Ukrainian Nazis were publicly honored at the White House by President Reagan, including Yaroslav Stetsko, Ukrainian Prime Minister under the Third Reich, who became the head of the anti-Bolshevik Bloc of Nations and a member of the World anti-Communist League . One of his deputies, Lev Dobriansky, became U.S. ambassador to the Bahamas, while his daughter Paula Dobriansky served as Under Secretary of State for Democracy (sic) during the George W. Bush administration. It is the same Ms. Dobriansky who for ten years sponsored a historical research with the aim of clouding the fact that the Holodomor, the famine that hit Ukraine in 1932-33, also devastated Russia and Kazakhstan, thereby reinforcing the myth that Stalin was determined to eliminate the Ukrainian people . In fact, Washington, who had supported the German Nazi party until 1939 and continued to do business with Nazi Germany until the end of 1941, never had a moral problem with Nazism, not more than it has today in providing military support to jihadism in Syria. Western European elites, who use Nazism as a pretext to harass firebrands – as seen with the “quenelle“ controversy over French comedien Dieudonné M’Bala M’Bala  – seem to have forgotten what it really is. In 2005, they closed their eyes to the rehabilitation of Nazism by the President of Latvia, Vaira Vike-Freiberga, as if it were something trivial . On the simple strength of statements in favor of the European Union, and wrapped up in their blissful Atlanticism, they are now in cahoots their worst enemy. Civil war could well start in the Ukraine during the Olympic Games in Sochi. “Washington et Moscou se livrent bataille en Ukraine“, by Emilia Nazarenko and the editorial staff, Réseau Voltaire, 1 November 2004. “Jihadists in charge of crowd control in Kiev protests”, Translation Alizée Ville, Voltaire Network, 5 December 2013. This is the cesspool that the father of the “Orange revolution” alighted from. Cf. “La biographie cachée du père du président ukrainien“, Réseau Voltaire, 18 April 2008. “Coup in Western Ukraine: the Arab Spring unleashed in Europe”, by Andrew Korybko, Oriental Review/Voltaire Network, 27 January 2014. “La NED, vitrine légale de la CIA“, by Thierry Meyssan, Odnako/Réseau Voltaire, 6 October 2010. “La Ligue anti-communiste mondiale, une internationale du crime“, by Thierry Meyssan, Réseau Voltaire, 12 May 2004. See: L’Holodomor, nouvel avatar de l’anticommunisme « européen », by Professor Annie Lacroix-Riz, 2008. “The Bête Noire of the French Establishment”, by Diana Johnstone, Counterpunch/Voltaire Network, 5 January 2014. “Latvian President Rehabilitates Nazism”, by Thierry Meyssan, Voltaire Network, 16 March 2005.